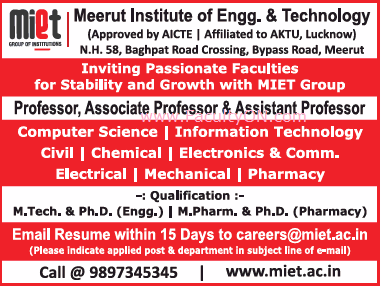 Meerut Institute of Engineering & Technology, Meerut has advertised in THE TIMES OF INDIA newspaper for recruitment of Teaching Faculty- Professor / Associate Professor / Assistant Professor jobs vacancies. Interested and eligible job aspirants are requested to apply within 15 days from 03rd October 2018. Check out further more details below. About College: Meerut Institute of Engineering and Technology (MIET) is an engineering institute located on NH-58 Meerut-Delhi Bypass, Meerut, Uttar Pradesh, India. The college is affiliated to Mahamaya Technical University, Gautam Buddha Nagar. The institute was established in 1997 by the City Educational and Social Welfare Society. The educationist Shri Chandra Sen Agrawal was the founding chairman of the institute. How to Apply: Interested and eligible candidates are requested to send their soft copy of applications with latest CV, copies of certificates and testimonials to the given email address. Please indicate the applied post & department in the subject line of email.